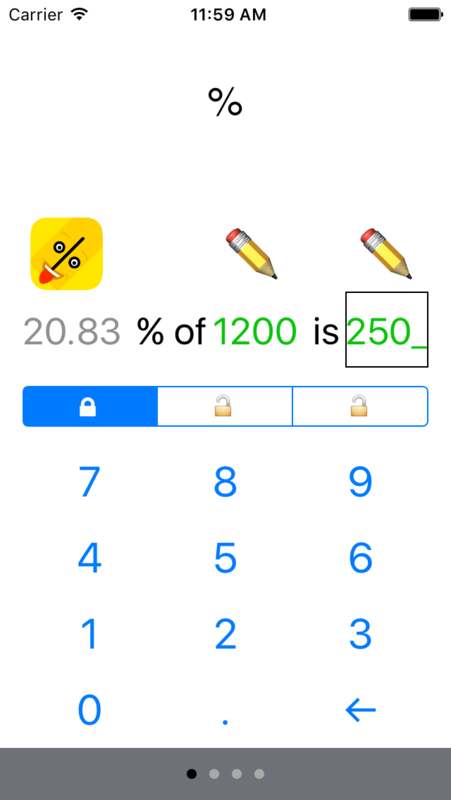 Without trying to educate the user, this App simply provides the answer to ones "percentage problem". The App contains three different "templates" by which one can solve any kind of percentage problem! The tool aviable for free at App Store, please pay back by rating the tool! Let us describe the easy to use and intuitive user interface! There are three number-fields. To use the tool, first pinpoint the the field that contains the unknown number, and then type in the known numbers in the remaining two number-fields! In the figure, we have selected the first number to be unknown, and then we have typed in the numbers 1200 and 250. As a result, the tool determine that the unknown number must be 20.83 (since 20.83% of 1200 is 250).